The biggest cliché in the collecting world is the “discovery” of a previously unknown cache of stuff that’s been hidden away for years until one day, much to everyone’s amazement, the treasure trove is unearthed and the collecting landscape is changed forever. As a corollary to this hoary trope, if you are in the right place at the right time, you can get in on the action before the word gets out. Cliché or not, that’s roughly what happened in 2008 when hundreds of artist John Gilroy’s oil-on-canvas paintings started to appear on the market. 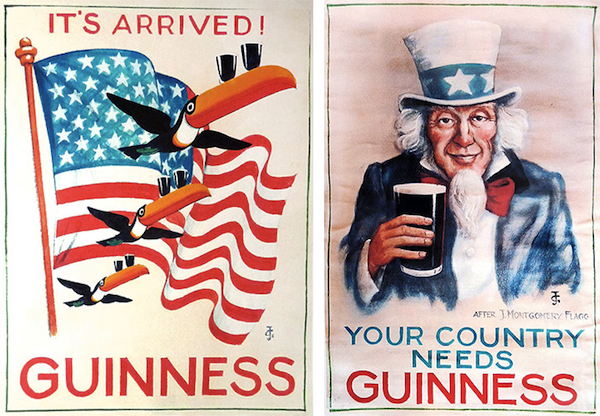 The canvases had been painted by Gilroy as final proofs for his iconic Guinness beer posters, the most recognized alcoholic-beverage advertisements of the mid-20th century. Before most collectors of advertising art and breweriana knew what had happened, most of the best pieces had been snapped up by a handful of savvy collectors. In fact, the distribution of the canvases into the hands of private collectors was so swift and stealthy that one prominent member of the Guinness family was forced to get their favorite Gilroys on the secondary market. 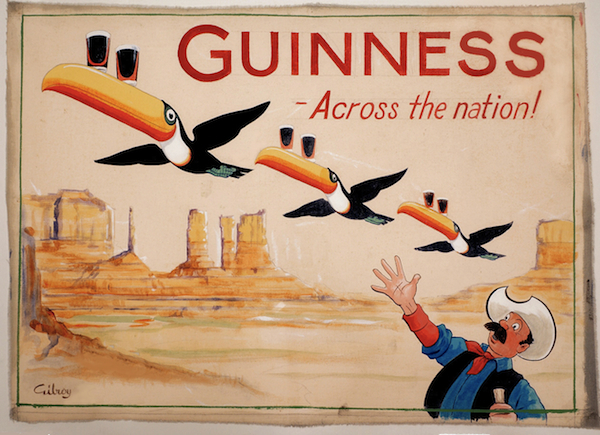 Top: Guinness-toting toucans at Mt. Rushmore, one of several John Gilroy paintings from the early 1950s created for a U.S. ad campaign that was ultimately canceled. 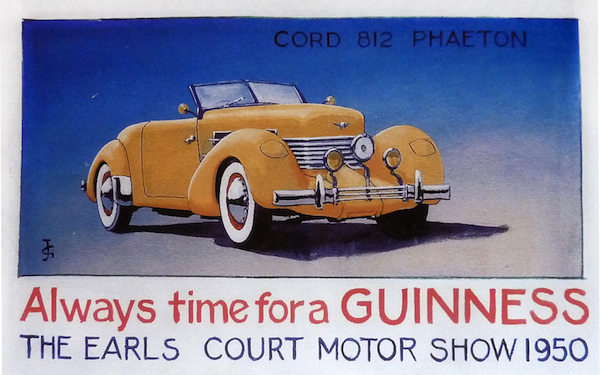 Above: In 1950, Gilroy painted classic cars for a Guinness calendar for the Earls Court Motor Show. The calendar was never printed. Among those who were particularly interested in the news of the Gilroy cache was David Hughes, who was a brewer at Guinness for 15 years and has written three books on Guinness advertising art and collectibles, the most recent being “Gilroy Was Good for Guinness,” which reproduces more than 150 of the recently “discovered” paintings. Despite being an expert on the cheery ephemera that was created to sell the dark, bitter stout, Hughes, like a lot of people, only learned of the newly uncovered Gilroy canvases as tantalizing examples from the cache (created for markets as diverse as Russia, Israel, France, and the United States) started to surface in 2008. 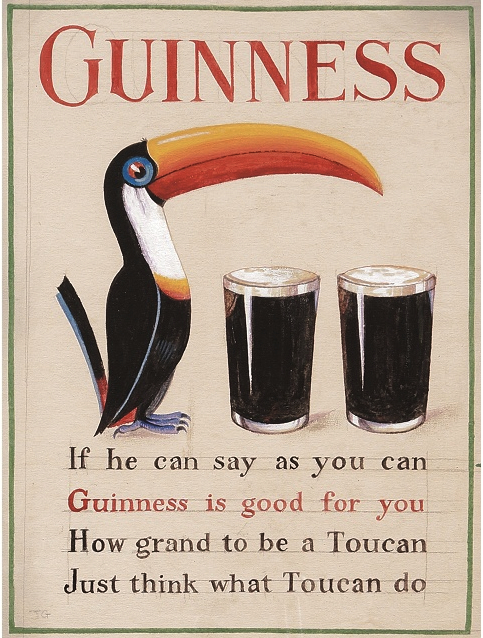 The 1935 debut of the Guinness toucan, with art by John Gilroy and a poem by Dorothy L. Sayers. Of all the advertisements reproduced for this article, this is the only one that was published. 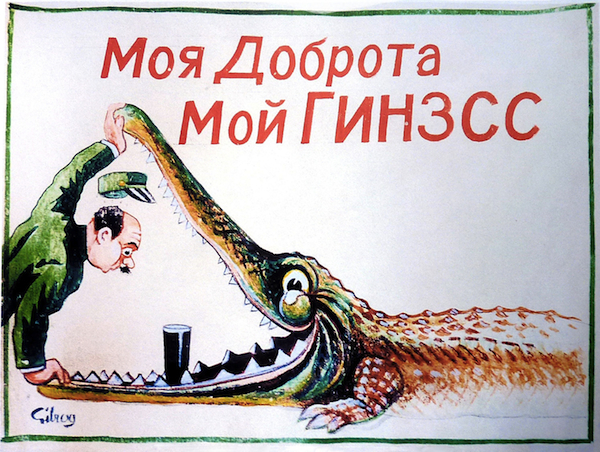 In 1950, the animals of the Guinness menagerie were slated for a Russian translation. Perhaps this one was cancelled for its Cold War undertones. That made the black beer friendly. To ensure that it would be appealing to the common man, Benson launched its “Guinness for Strength” campaign, whose most famous image is the 1934 Gilroy illustration of a muscular workman effortlessly balancing an enormous steel girder on one arm and his head. 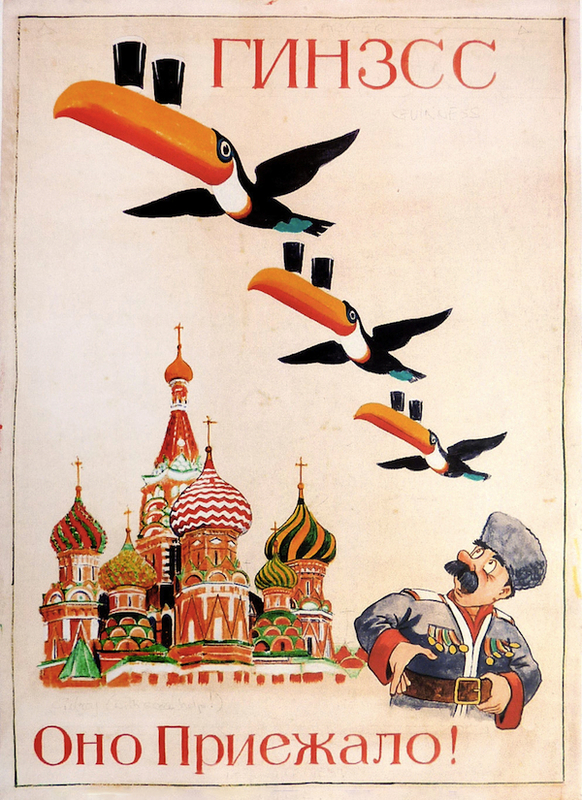 Toucans over Red Square in Moscow, 1950. This ad never ran. Gilroy’s animals good-naturedly tormented their zookeeper by stealing his precious Guinness: An ostrich swallows his glass pint whole, whose bulging outline can be seen in its slender throat; a seal balances a pint on its nose; a kangaroo swaps her “joey” for the zookeeper’s brown bottle. Often the zookeeper is so taken aback by these circumstances his hat has popped off his head. In fact, Gilroy spent a lot of time at the London Zoo to make sure he captured the essence of his animals accurately. “In the archives at Guinness,” says Hughes, “there are a lot of sketches of tortoises, emus, ostriches, and the rest. He perfected the drawing of the animals by going to the zoo, then he adapted them for the adverts.” As a result, a Gilroy bear really looked like a bear, albeit one with a smile on its face. Another aborted “My Goodness, My Guinness” advertisement, this one for Germany, 1936, before Hitler’s intentions were so apparent. 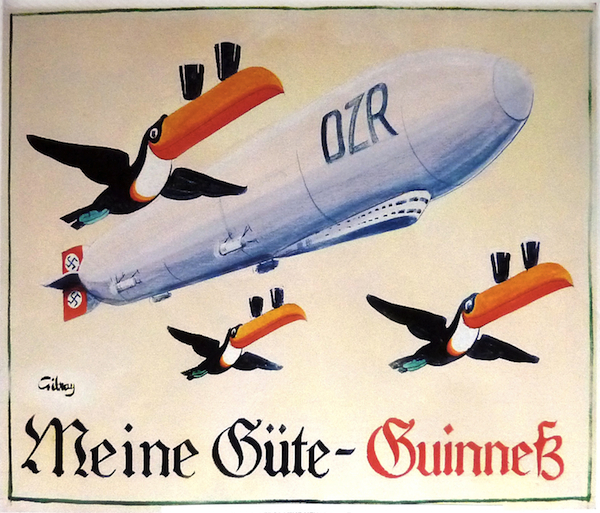 During World War II, Gilroy’s Guinness ads managed to keep their sense of humor (eg: two sailors painting the hull of an aircraft carrier, each wishing the other was a Guinness), and in the 1950s and early ’60s, Gilroy’s famous pint-toting toucans flew all over the world for Guinness, in front of the Kremlin as well as Mt. Rushmore, the Leaning Tower of Pisa, and the Statue of Liberty, although some of these paintings never made it to the campaign stage. 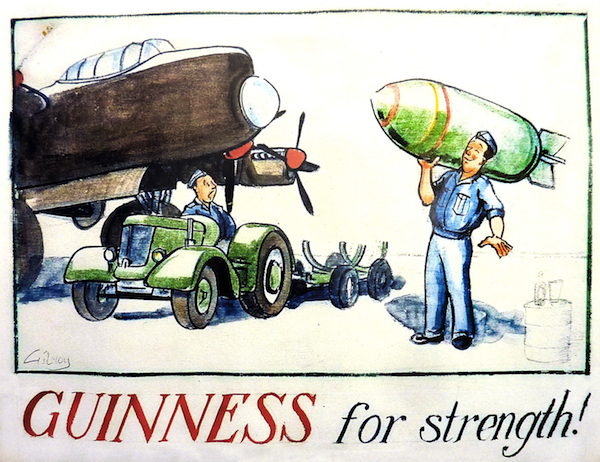 In 1946, the “Guinness for Strength” slogan was almost applied to the image of a serviceman unloading bombs from an Avro Lancaster bomber. At least the paper got a good home. As for the canvases? Well, their history can only be pieced together based on conjecture, but here’s what Hughes thinks he knows. One of several images for an ad campaign designed for viewing in the Houses of Parliament. Fair enough. What we do know for sure is that the years were not kind to Gilroy’s canvases while in storage at Benson’s. In fact, it’s believed that more than half of the cache did not survive the decades and were probably destroyed by the mystery collector who bought them because of their extremely deteriorated condition (torn canvases, images blackened by mildew, etc.). After all, when Gilroy’s canvases were put away, no one at Benson’s thought they’d be regarded in the future as masterpieces. Toucans in Monument Valley, another image from the ill-fated U.S. ad campaign of the early 1950s. Although he has no proof, Hughes believes the person who bought the cache in the 1970s also oversaw its preservation. Importantly to many collectors, all of the Gilroy canvases are in their found condition, stabilized but essentially unchanged. Even areas in the paint that show evidence of rubbing from adjacent canvases remain as they were found. “I think the preservation has been done by the owner,” Hughes says. “I don’t think the dealers did it. It’s my understanding that they were supplied with fully stabilized canvases from the original buyer. It appears that they were shipped from the U.K., so that’s interesting in itself.” Which suggests they never left the United Kingdom after being purchased by the mysterious American millionaire. These patriotic compositions were for the canceled U.S. ad campaign of the early 1950s. The one on the right reads “After J. Montgomery Flagg,” the artist who created the iconic Uncle Sam. Finally, for Guinness, breweriana, and advertising-art collectors, the Gilroy canvases also offer a peek of what might have been. “I would say about half the images were never commercially used, so they are absolutely brand new, never been seen before,” says Hughes. “They’re going to blow people away.” Of particular interest to collectors in the United States are the Gilroy paintings of classic cars that were created for an aborted, early 1950s campaign to coincide with the brewing of Guinness on Long Island. 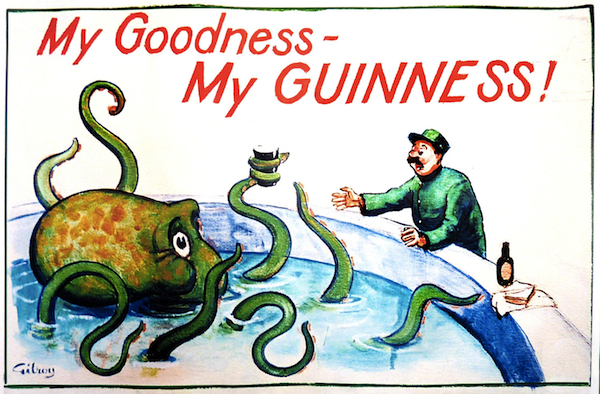 Most of the zookeeper ads featured the “My Goodness, My Guinness!” slogan, but this octopus from 1952 never made it into the menagerie. Still, it’s the medium that continues to amaze Hughes. “The idea of the canvases, none of us expected that,” he says. 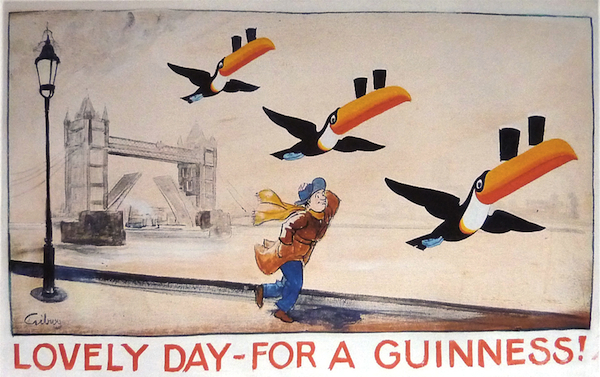 “As a Guinness collector, I’ve always collected their adverts, but they’re prints. They never touched Gilroy, he was never anywhere near the printing process. I had acquired a pencil drawing, which I was delighted with. Then these oils started turning up,” he sighs. There are two versions of this rhino from 1950. Neither made it into print, but they are David Hughes’s favorite Gilroys. That sums up Gilroy to Hughes; not that it’s only appealing to people in their 80s, but that his work is ultimately about making people happy, which is why his advertising images connected so honestly with viewers. “Gilroy had a tremendous sense of humor,” Hughes says. “He always saw the funny side of things. He was apparently a chap who, if you were feeling a little down and out, you’d spend a couple of hours with him and he’d just lift your spirits.” You know, in much the same way as a lot of us feel after a nice pint of Guinness. I just received a copy of David’s book and it is a wealth of information. Highly recommended just for the art alone. i aquired a print (i believe) signed by gilroy. it came from ireland and is framed in an old barnwood frame. it’s the man with the steam shovel. i would love it if anyone could direct me to a site to find more information on this piece. an original antique never seems to come up when i search. thanks for any info. 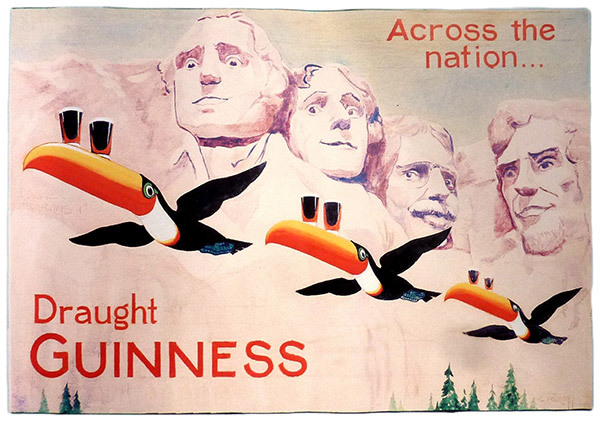 I have a large, flat box full the the toucan with the Guinness pint balanced on his bill. 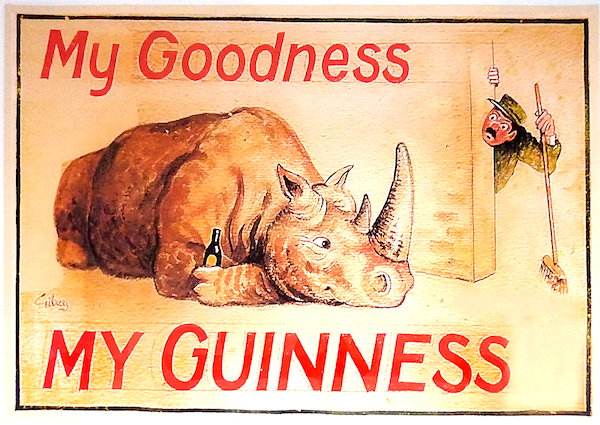 There are also many of the “After Work Guinness” posters. All are new. After reading this article I know what to do with them now. Thanks for the info. “ ” The more fears, the better the box-office receipts.